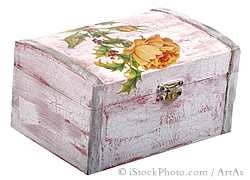 Decoupage is a French word meaning cutting up or cut-out. It came to be used for the technique of decorating objects with cut up pieces of paper glued to the surface. As with most crafts, it probably doesn't have a single point of origin. Antique decoupaged objects can traced to Siberia, China, Italy, Germany, Poland and of course France to name a few places. Traditional decoupage requires gluing the paper in place followed by varnishing. In order to achieve a smooth finish, many layers of varnish are required and the object would need to be sanded between coats. 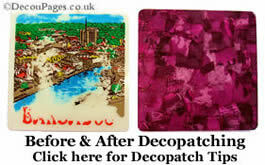 Decopatch papers are thinner, so it doesn't require layers of varnish to give a smooth finish. The combined glue and varnish also makes the whole process much easier. The decopatch glue-varnish and aquapro varnishes are water based so you won't be inhaling solvents as you work. 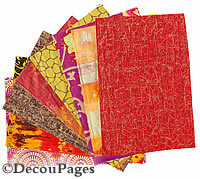 Your only problem now it to decide whether to say you are a decoupeur or a decopatcher!